Find your Holy Land incoming tourism professional. Order for free or download the new HLITOA catalogue for the German market: Spezialreisekatalog “Palästina, Israel & Jordanien”. Discover the adventurous Palestine and meet our tourism professionals as AdventureNEXT Near Conference in Aqaba, April 1-3 2019. Download the 2019 edition of the HLITOA Directory of Palestinian Incoming Agents for free. Our mission is to provide you the experience of discovering the region without the complexities of navigating logistical challenges. HLITOA members have the experience and knowledge to help you through the complications of international and cross-cultural travel in a region that has more than its fair share of challenges, alongside its many virtues. Through our HLITOA Members Directory, we provide you with contacts to out network of incoming tourism professionals and through our wide range of marketing activities and promotional campaigns, it is our key objective to foster economic growth while preserving national heritage and a sustainable development of tourism in the Holy Land. Our members have a unique advantage to offer: 100% full coverage and ease of accessibility in Palestine, Israel & Jordan, as well as coverage for extensions to Egypt and Lebanon. There are literally no white spots on the map when operating your tour. Each of our members have a history involvement in tourism and pilgrimage. Most business are family-run, many for generations, and have collected expertise over many years and through changing situations. Through a close network of information, our members have knowledge of a situation before it escalates into a problem, giving them the upper hand in solving matters fast and assuring a smooth and safe tour operation. In a context where situations change at very short notice, our members provide round the clock service before, during and after any of your tours. Continuous updates on evolving situations keep you informed before your clients might start worrying. Bringing the best of the Holy Land together, our signature itineraries cover the entire area east and west of the Jordan Valley from every angle. Browse through our hand-crafted programs and explore the full diversity our incoming tourism professionals can offer you and your clients. You can find all our itineraries in our 2018 HLITOA Sales Guide and Tour Operator’s Manual for the Holy Land. 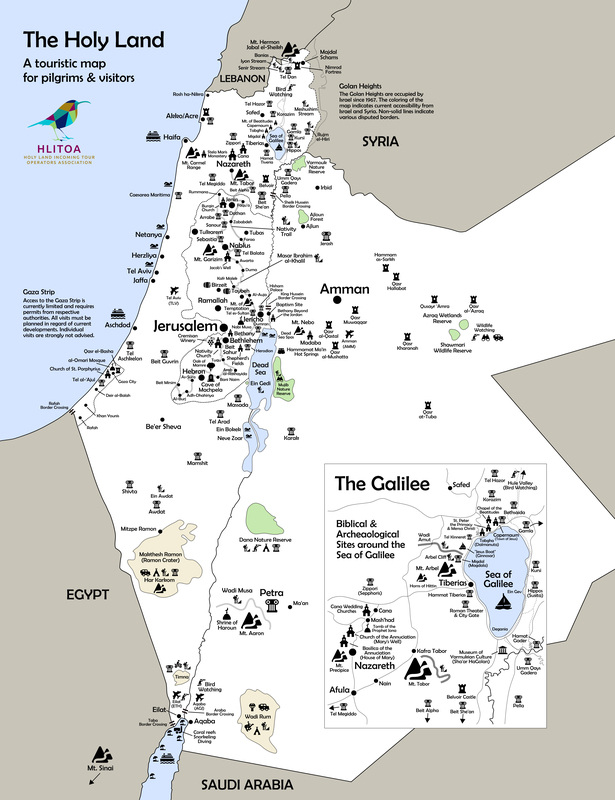 Designed entirely from a tourism perspective, our HLITOA map of the Holy Land features the best the region has to offer. Download your free copy and use it in your marketing and customer approach! HLITOA Karte des Heiligen Landes (hohe Auflösung, pdf, ca. 14 MB). Die Karte gehört zu unserem Destinations-Kartenset.